Monterey County, renowned for its rugged natural beauty, is nirvana for the wine tourist. Without the hustle and bustle of superstar regions Napa and Sonoma, Monterey’s low key and laid back wine scene has slowly evolved, but is now poised for explosive growth. 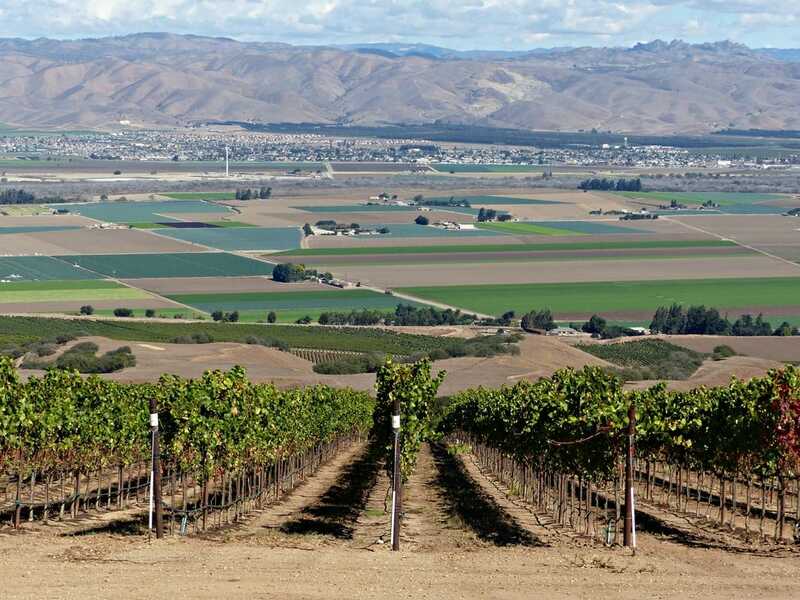 Vistas of vineyards, with almost 50,000 acres planted, and 30 wine grape varietals grown, keep 82 wineries busy. And if you pour it, they will come. Wine Enthusiast has recognized Monterey wine country as one of the world’s top ten wine destinations, California’s premier sweet spot where Pinot Noir and Chardonnay shine bright. With so much to offer, from outdoor adventures, sightseeing, world class golf courses, and art, in addition to excellent food and wine, Monterey County is incredible bang for your buck, and should be on your must visit soon list. "Carmel-by-the-Sea", the quaint European-style hamlet that overlooks the Pacific Ocean, offers something for everyone. Rated as a top 10 US travel destination, Carmel's compact town center, one mile square, is a cornucopia of shops, art galleries, wine tasting rooms, spas and salons, restaurants and cafes, and hotels. 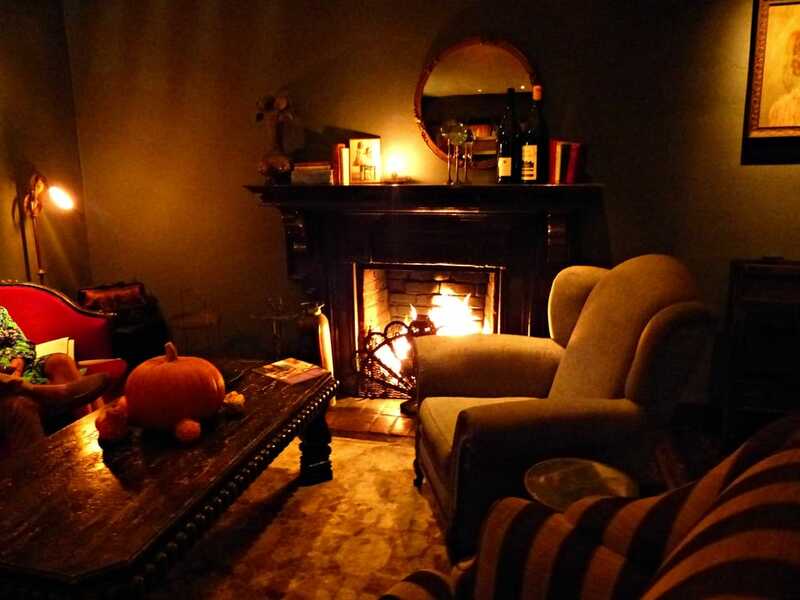 No street lights, parking meters, or numbered addresses confine its bohemian nature. This "village in the forest", surrounded by pine trees and a white sand beach, is free form and enchanting. You'll want to spend at least three days here, making it the hub for many wine adventures. 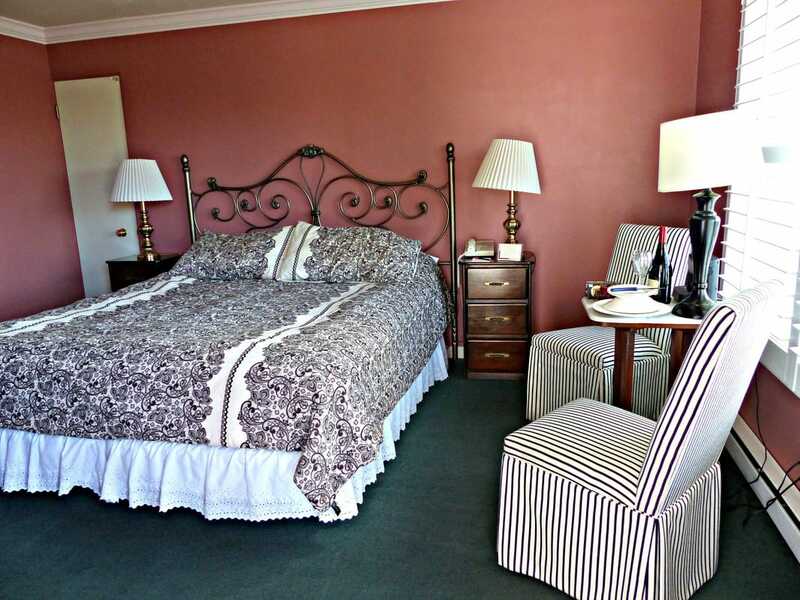 The Hofsas House, family owned for over 60 years, offers relaxation in a retreat setting. The Theis family, who operate the hotel, continue a tradition of hospitality handed down by the original founders, Donna and Fred Hofsas. Grandchildren Carrie and Scott, along with their mother Doris, work hard to ensure travelers feel right at home, weaving modern conveniences into a tapestry of European charm. The Bavarian motif is a nod to the Hofsas’ German roots, welcoming guests with artist Maxine Albro’s mural across from the office, along the driveway. This pink, Bavarian themed hotel, offers many amenities, from a heated swimming pool and dry saunas, to complimentary continental breakfast and free WiFi. Thirty-eight spacious rooms, all uniquely decorated, are cozy, many with fireplaces to stay toasty by. The Pacific Ocean adds to the ambience, Dutch doors on all the rooms can be opened, ushering in the cool ocean breezes. Because the hotel is on a hillside overlooking the Pacific, many rooms on the backside have great ocean views, framed by the village pine trees. For the rooms without their own balcony, outdoor decks encourage guests to linger, over morning breakfast or sunset wine and cheese. Family and dog friendly, larger suites are available, comfortably furnished, many with a kitchenette. The Hofsas House offers several packages, from romance to golf, including a popular Carmel Beach Fire and S’Mores Bundle, and perks for additional nights. Located just three blocks from the center of town, the Hofsas House is a good jumping off point for touring all of Monterey County. Their staff helps guests navigate the myriad choices, arranging everything from sightseeing, wine tasting, or just leisurely strolling the village streets, with a map in hand. Hofsas House is a popular choice for visitors, many who come again and again, to enjoy this home away from home. For the wine tourist, the beauty of staying in the village of Carmel is convenience, and not having to worry about a designated driver. Fourteen Monterey County wineries have tasting rooms within easy walking distance of most of the village hotels. 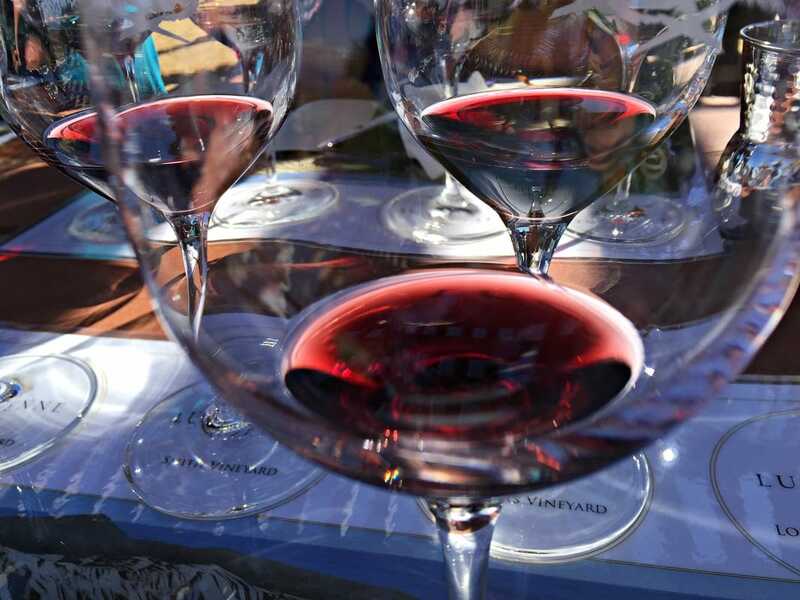 The Carmel Wine Walk-by-the-Sea Passport is the perfect introduction, it is your ticket to tasting wines at your choice of 9 of the 14 tasting rooms that are open daily. You can purchase it for $65 from the Carmel Chamber of Commerce, or, as in my case, the Hofsas House concierge can arrange to have the passport waiting for you upon check-in. The Wine Walk passport doesn’t expire, so no rush, you can linger with a glass, and return again to pick up where you left off. 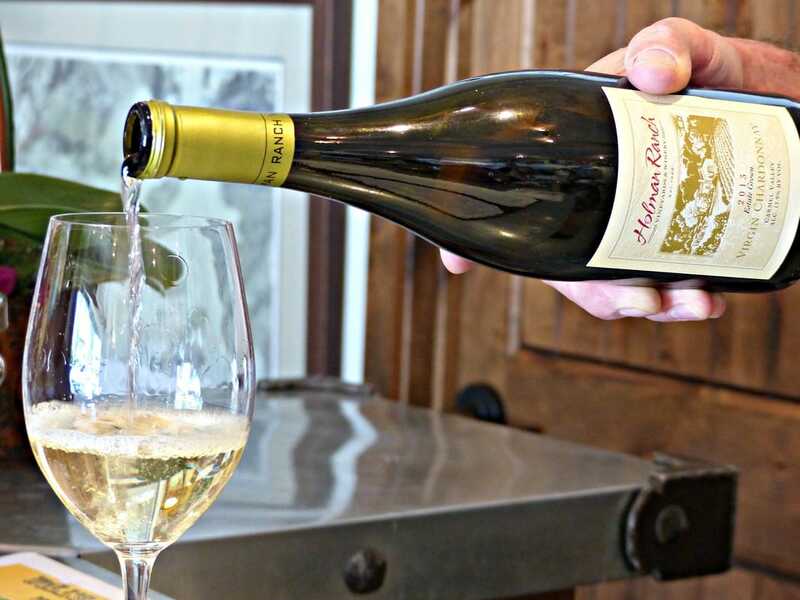 An additional perk, some local restaurants waive corkage on bottles purchased at a Carmel Wine Walk tasting room, but there is a limit of one bottle per visit. This Wine Walk famously stars Pinot Noir and Chardonnay, mostly from the Santa Lucia Highlands. Caraccioli Cellars is unique, producing sparkling wines as well as still, setting themselves apart from the crowd. Scott Caraccioli says they have “a complete commitment to making bubbles”, painstakingly crafting their Brut Cuvée and Brut Rosé, controlling the process from beginning to end, starting with only estate grown fruit as of 2015. “It really showcases the place and the year through sparkling wine” Scott observes, “that’s really the majority of our production, and the majority of our focus”. Winemaker Michel Salgues works to keep the quality high, with extended aging, on the lees and in bottle. Both wines sparkle with a cascading stream of tiny bubbles, the Brut Cuvée is aromatic with Meyer lemon, pineapple, and brioche; the Brut Rosé redolent of citrus and ripe apple, laced with a subtle yeastiness, and both wines linger on the finish. The still wines are good, especially the Chardonnay, the 2011 vintage is aromatic, with lemon, pear, pineapple, and hints of butterscotch, it’s creamy, with good acidity, and a round finish, very nice! 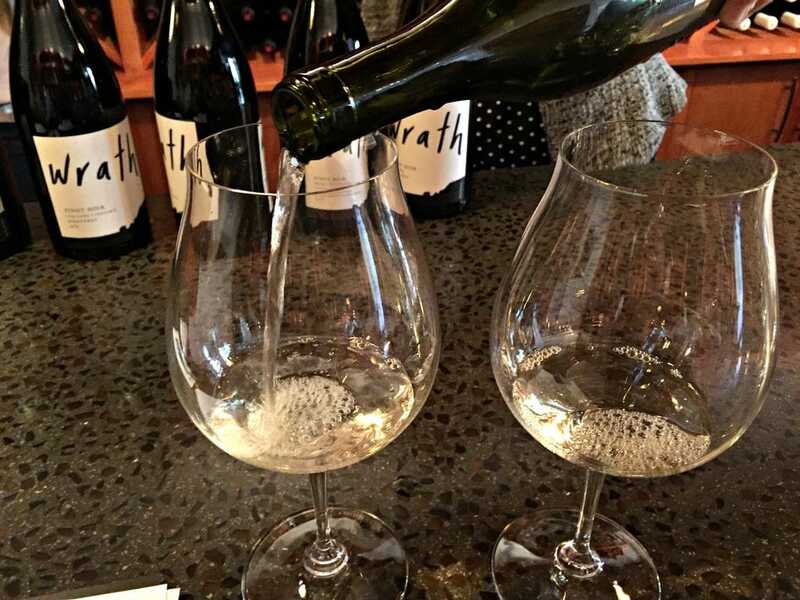 Wrath Wines, tucked into the lower level of the Carmel Plaza, also specializes in Chardonnay and Pinot Noir, yet is a study in clones. At Wrath, three separate collections of wines are made, the Ex Anima, Winemaker Series, and Single Vineyard Series. Winemaker Sabrine Rodems crafts the wines like a chef, she has numerous clones, single vineyards, and several winemaking techniques, like whole cluster and malolactic fermentation, to choose from. Clones become the spice rack, blending different clones of the same grape makes for a more complex wine. Because Mother Nature is kind to the Santa Lucia Highlands AVA, near perfect grape growing weather happens every year, allowing ripe, concentrated, well balanced wines to be made on a consistent basis. When the usual challenges to winemaking aren’t an issue, it frees the winemaker to tinker. According to Sabrine, it’s the experimentation that is exciting, finding out what works and what doesn’t. “You have to have an open mind, look outside your assumptions, think beyond what you think is right. How can you understand farming completely unless you go to all the corners of the square? In the vineyard, we crank it to the right, and see how the vineyard behaves, then crank it to the left, and see how the vineyard behaves, early pick, late pick, high concentration of whole clusters, low concentration of whole clusters, and everything in between, that is the key to figuring out what your vineyard’s about”. It’s a real education to taste through the Pinot clones, from Pommard 4, Swan, 828, 115, 667, 777, you start to discover which ones appeal to your individual palate. For example, two very good wines that are as different as cherry and earth; the 115/667 Pinot is very cherry, spicy, and with a touch of wild herbs, whereas the Pommard 4/777 is earthy and spicy, less fruity. Both are delicious, yet different. 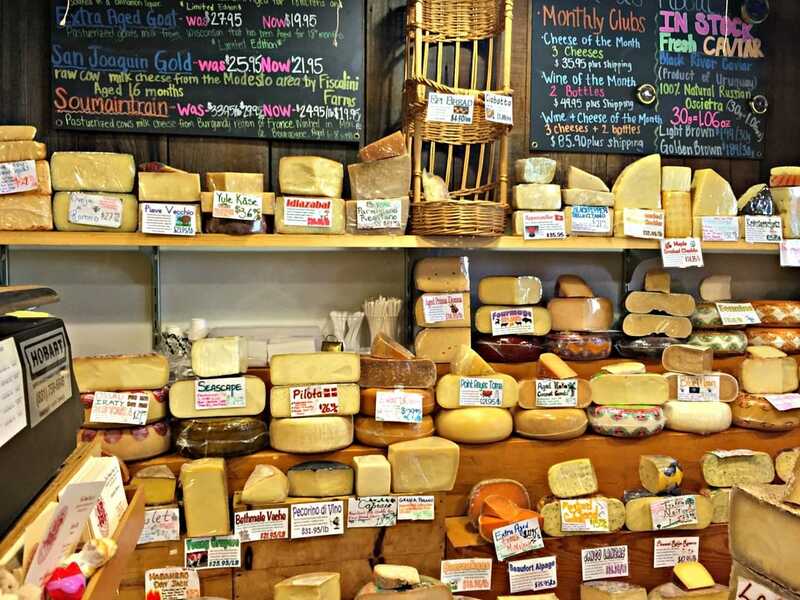 It's difficult to choose from the almost 200 cheeses and other delectable goodies at The Cheese Shop of Carmel. The Cheese Shop, adjacent to Wrath’s tasting room, has the most incredible selection of cheese I’ve ever seen. Over 200 artisanal cheeses from all over the world, including a concentration of spectacular local cheese, are piled high on the counters. Passionate, knowledgeable, and helpful, Kent Torrey and his “Cheesehead” staff are quick to offer a slice of this, a morsel of that, along with tidbits of information, where it came from, or how it was made. The enthusiasm is infectious, you want to hang around and learn, and before you know it, your bag is full of cheese and all its accompaniments. A large selection of wine is stacked high at the back of the store, along with a small tasting bar, making The Cheese Shop a one stop shop for a picnic, on the beach or in your room. 5th Ave Deli caters to locals and travelers on the go, fueling the day's adventures with an assortment of delicious soups, salads, and sandwiches. This tiny shop packs a culinary punch, starting with breakfast and continuing on throughout the day. Strictly a take-away spot, create your own sandwich or choose from several picnic lunch boxes. Noted for their Harris Ranch Tri-tip and Tarragon Chicken salad, 5th Ave Deli also carries snacks and drinks, including wine and champagne, making it easy to pack a gourmet picnic for the beach or the vineyard. Just 10 minutes away by car, the town of Monterey offers many different dining options, here are a couple of intriguing spots. Restaurant 1833, considered the best restaurant in Monterey, is located in a historic adobe house with a checkered past. Formerly known as Stokes Adobe, the house has a spooky vibe that channels lots of ghost stories. Starting with James Stokes in 1837, a self-proclaimed doctor whose medical misdiagnoses and failed elixirs resulted in some scandalously fatal mistakes, to early 1900‘s socialite Hattie Gragg, whose ghost is said to haunt the building, waiters regale diners with accounts of paranormal sightings. Salt block candleholders burn on every table, to keep Hattie away, since according to the staff, she mischievously adds salt to diners’ wines to announce her presence. There are seven lounge and dining areas that are strikingly outfitted in dark woods, leather booths, and marble-topped bars, all accented by dim lighting. Award-winning seasonal cocktails, table-side martini cart concoctions, and a full-blown Absinthe service compliment the esoteric wine list, where local gems from Monterey’s neighboring wineries are found alongside international legends. Seattle transplant, Chef Jason Franey, has created an exciting farm-to-table menu, innovative and totally out of the box. 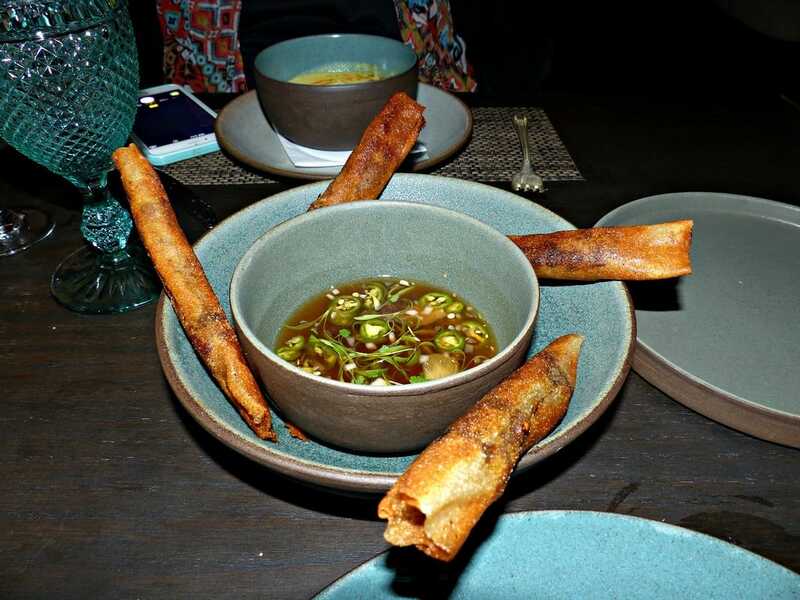 From the baby back rib appetizer, whose shredded meat is presented in a crunchy egg roll, served with a Vietnamese fish dipping sauce, to crisp skinned salmon, surrounded by mussels, clams and baby artichokes in a saffron broth, the food is sophisticated yet playful. After dinner, lounge around one of four fire pits in the front courtyard under the canopy of three huge trees, including a 150-year-old mighty oak, that represents the essence of California. 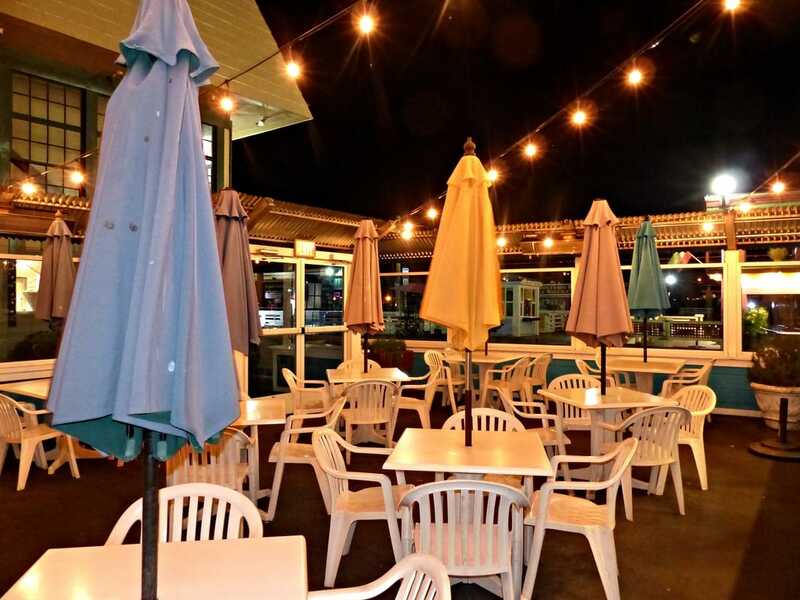 Abalonetti Bar & Grill, located on Monterey’s Fisherman’s Wharf, is not just any tourist seafood spot. 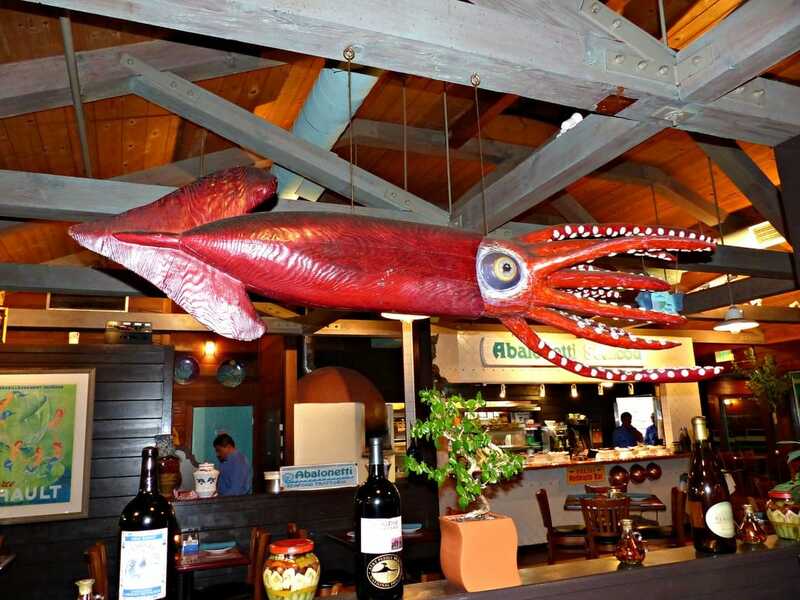 Here, calamari is the specialty, and super fresh, as Abalonetti is one of the few restaurants locally to serve squid right out of Monterey Bay. 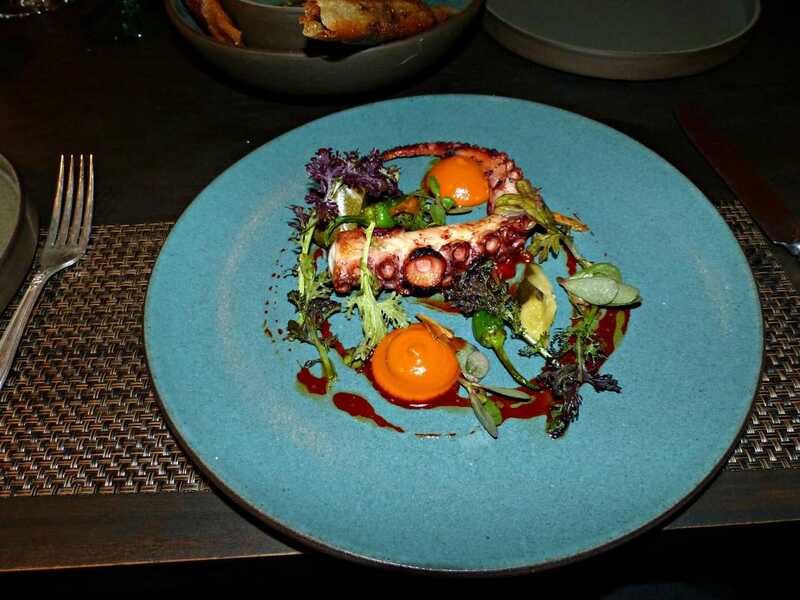 It seems that all the squid caught by local fishermen is shipped to China for processing, to save on labor costs, and then shipped back to Monterey’s restaurants. Abalonetti has cut out the middle man, and employs a one man dynamo, Faustino Perez, who cleans roughly 1,000 pounds of squid every week, practicing a lost art here in the “Calamari Capital of the World”. Abalonetti’s menu has a section dedicated to calamari, in all its incarnations, offering many variations on this very fresh squid, from classic flash fried to simmered in marinara. The Marty Special, a popular combination of both techniques, is a fried eggplant/calamari dish, smothered in spicy Sicilian marinara, and topped with Parmesan and Mozzarella cheese, extremely delicious yet very filling. The wine list is populated with local Pinot and Chardonnay. This is casual waterfront dining, with rustic wooden tables, adorned with a large carved wooden squid that hangs from the ceiling. A large outdoor patio, protected from the wind, is pleasant, and even caters to man’s best friend. Dog friendly isn’t even the half of it, Abalonetti even has a special dog menu, served in a keepsake Frisbee! Friendly and welcoming, Abalonetti is perfect for family dining or even a romantic dinner for two. The Santa Lucia Highlands nurtures 46 mountainside vineyard estates, and while many vintners choose to display their wines in Carmel tasting rooms, almost a dozen wineries are open for exploration along Monterey’s River Road Wine Trail. Winding along the base of the mountains just west of Salinas, River Road is at the heart of the region’s agriculture, surrounded by crop fields, orchards, and vineyards of three separate AVAs, Santa Lucia Highlands, Arroyo Seco, and Monterey, the cradle of spectacular Pinot Noir and Chardonnay. Breathtaking vistas, picnic grounds and friendly tasting rooms bring the wine tasting experience to new heights, where you can walk among the vineyards and get a tour of the cellar. Before setting out, check with the wineries you’re interested in visiting for their hours of operation. Some, like Hahn and Scheid, are open daily, where others are strictly a weekend venture. Nestled in Carmel Valley, about 15 minutes inland from Carmel-by-the-Sea, over 20 wineries, tasting rooms, and wine bars are clustered along the main drag, with a large number concentrated in a small Old West-style town, making for a walkable wine tasting. Another option for exploring the tasting rooms is the Happy Trails Wagon, a 10-passenger wagon pulled by an antique tractor, operated by local legend “Cowboy Pete” Azevedo. Protected from the marine layer that blankets the Highlands, it’s warmer here, allowing Cabernet Sauvignon and Merlot to fully ripen. Bordeaux blends reign here, of note are Bernardus, Georis, and Heller Estate Organic Vineyards. 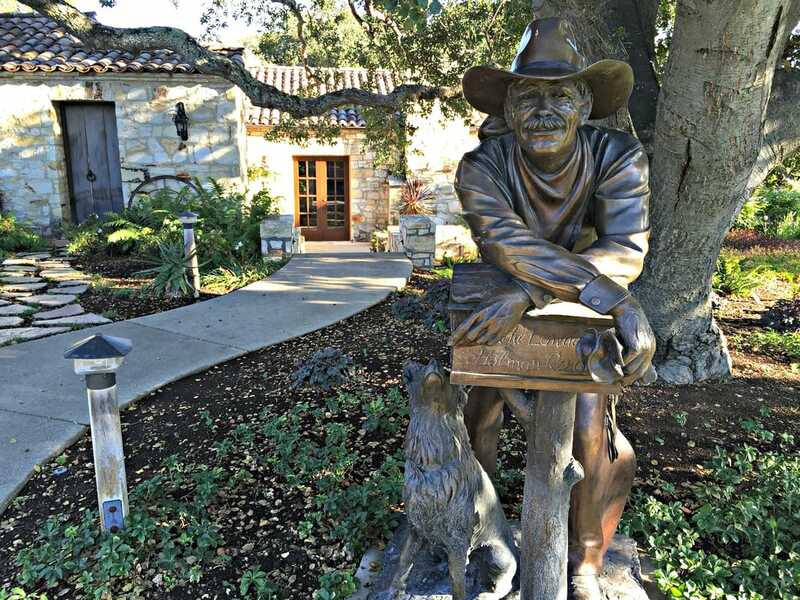 Holman Ranch operates a special event guest ranch, a tasting room that spotlights their Jarman and Holman Ranch wines, and a restaurant, Will’s Fargo Steakhouse + Bar, nothing like a steak to enjoy with your big red at the end of a day of wine tasting! Monterey Wine Country, home to top-notch food and wine, sophisticated shopping, upscale art galleries, stunning scenery, world class golf, and lots of outdoor activities, is a great value. It’s been relatively undiscovered as a wine getaway but the word is out, get here before the crowd does.